Well, what a day and where to start? First off thanks again to everyone who has donated and expressed support for the cause and the challenge. We all felt your encouragement and inspiration as we pushed ourselves to the limit on September 2nd 2011. All in all, the trip went quite well. Leading up to the challenge day we were very disappointed to see two participants forced to remain behind. Kirsten Hagen had to pull out due to injury and Sean McLean due to work commitments. This left a final group of nine people that consisted of five attempting the double crossing: Mike Danskin, Lindsay Hewson, Gary Fenwick, Whitney Merrill and Nick Brown; as well as a support crew of four: Beth and Danny Danskin, Stuart Soward and John Hewson. Stu and John both planned to hike from the South Rim to the river and return to the South Rim with the double crossing crew. Beth and Danny would drive to the North Rim and meet the double crossing crew to provide extra supplies and act as a safety net for anyone unable to make it back through the canyon. Views from the Airplane window of Calgary at 10 Degrees and raining and Phoenix at 45 Degrees and cooking! The major concern of the trip became very evident when we stepped out of the air-conditioned comfort of the airport and into the dry desert temperatures of 45 degrees! Stu said it felt like living in a blow dryer! We were told this was the kind of heat to expect in the canyon and the allusions would prove to be true. We arrived at our accommodations on the rim of the Grand Canyon in the evening on August 31st and were already looking forward to a free day to adjust to the canyon before attempting the challenge on September 2nd. The rooms were lacking AC, which when combined with frequent wake ups from a resident chipmunk scavenging for snacks, we were doomed to have some rather unsettled sleep! Our free day consisted of a short run to get a lay of the land as well as to get a taste of the heat and elevation. We had a team dinner and prep-meeting that night and crawled into bed after setting a 3:00 AM alarm. The chipmunk could always act as our back up alarm if needed! With headlamps on, we arrived at the Bright Angel Trailhead at 3:45AM and after the pre-run photos were snapped we were off and running at 4:00 AM. It was a little breezy at the rim and a few folks opted for a long sleeve option to start; however, within the first 200 m of switchbacks we ran into a wall of heat that had everyone pealing off the layers in anticipation of steady temperature increases on our way to the middle of the canyon. The first 7.5 km was easy going downhill with a few loose rocks and steps that switch-backed to Indian Garden Campground. Upon arrival at the campground the thermometer read 22 oC and it was not yet 5 AM! After descending the Devil’s Staircase the sun was just beginning to highlight the canyon rim and we switched off the headlamps. We crossed the river at Silver Bridge at 6:30 AM and everyone was feeling strong and positive about the adventure that lay ahead. There had been several water filling stations prior to the river but we all decided to top up at Phantom Ranch, the 15 km mark. 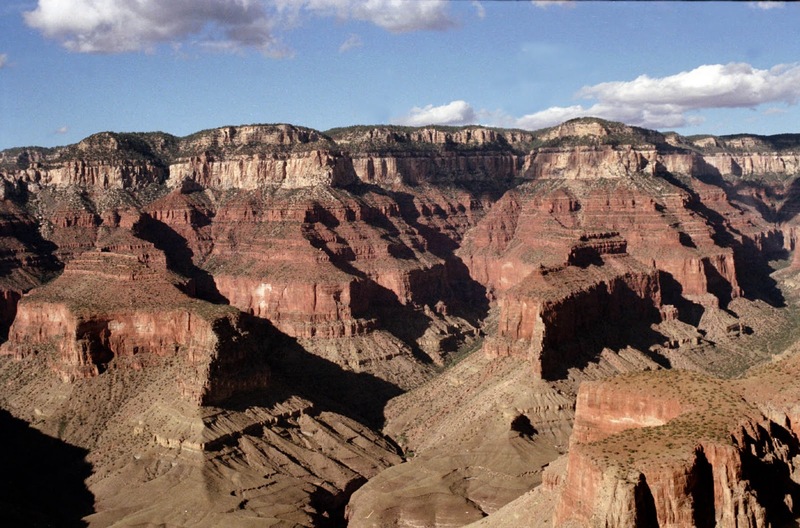 We then began our trek along the North Kaibab trail to the North Rim. From Phantom Ranch to Cottonwood Campground it was 12 km of slow and gradual incline. This was where we got our first feeling of direct sunshine. The group had been running together up until this section but the initial signs of the heat began as Whitney was having difficulty controlling her body temperature. She was experiencing chills and nausea that induced a spit up so Nick and Whitney decided to slow things down and arrived a little later to Cottonwood Campground. Hydration can be a tricky game and in the heat and dryness of the canyon, sweat will quickly evaporate causing you to question whether you are sweating at all. Upon arrival at Cottonwood, Nick and Whitney had only taken in a single liter of fluids since the river, compared to three liters each for the other three members. These indicators are all the first steps towards heat exhaustion and signs that would become magnified later on the trip. It was another 11 km to the North Rim from Cottonwood and consisted of more power hiking than running. We were in the heat quite a bit more through this section and also heard our first rattle from a disgruntled snake hidden under a large rock beside the trail. Through two-way radios our groups stayed in regular contact but it was evident that the gap was widening. Lindsay, Gary and I hit a point where the heat, elevation, and incline were all becoming a greater factor and decided to sit down and take in some food and fluids. After a good pump-up chat and a stretch we were off again only to walk around the corner and realize the North Rim was but a mere 100 m from where we had decided to rest! Our time to the North Rim was 7.5 hours and we were excited to recharge the bodies and restock our bags. Restocking the bags in front of a very interested crowd! Beth and Danny Danskin had driven around the Canyon from the South Rim to the North Rim and after rebounding from some bad directions they rolled up with some much needed supplies. We were in touch with Whitney and Nick who were now an hour behind but still in positive spirits. Lindsay, Gary and I decided to get a move on and passed Whitney and Nick on the trail. After some hugs and comments on Nick’s salty apparel, the two groups parted ways. The decision would be up to Whitney and Nick as to whether they would continue back in to the canyon or return with the van to avoid the obvious concerns of heat exhaustion and safety issues. Nick a few kms from the North Rim. Looking Salty! On our way back into the Canyon we caught word over the radio that a decision was made and between a slower pace and increasing temperatures, Whitney and Nick decided to play it safe and opt out of a return trip through the canyon. This would’ve been a very difficult choice and commendable on their part, as they did not want to chance putting their own safety and the safety of the group at risk. They would drive back around to the South Rim with Beth and Danny and make a 2 km hike back down into the canyon to provide some much needed motivation and encouragement to those of us returning on the second crossing. As Lindsay, Gary and I made our way back to the South Rim, along the North Kaibab Trail, the heat was increasing significantly. Temperatures hit a high of 45 oC over a 15 km stretch of direct sun exposure before reaching cooler shaded regions of 30-35 oC! Gary was showing the first signs of heat fatigue during this hot section and we began to slow our pace. Despite the intense climate and desolate desert terrain, everyone’s spirits were high and reaching Stu and John at the river remained a motivating juncture. Blisters became a nuisance for both me and Lindsay, but were detected early and through the application of a duct tape and Vaseline combo, the problems seemed to be alleviated. Gary was able to avoid any issues with his feet by doing all of his Grand Canyon training without socks. This helped toughen up his skin and create the necessary calluses in preparation for the run. We passed through The Box where Bright Angel Creek has carved a deep channel in the canyon and its narrow walls provided some much needed shade. The sun was just setting as we arrived at Phantom Ranch where we were met by John and Stu’s smiling faces. They had already had a big day coming down the South Kaibab Trail and after some quick discussions, Lindsay decided that she would stay with John, her Dad, and Stu to ensure they would be strong enough and hydrated enough to make it out of the canyon that night. Gary and I decided to press on but after crossing the river, I realized I had left my camera 1.5 km back at the Phantom Ranch water station! After running back to retrieve the camera I was met with disappointment because the camera was not there. I was absolutely crushed as the camera contained all the photo and video footage to this point. I filed a report with a Park Ranger and ran back to my bag that had been left with Gary at the river. Perhaps this will be funny in a couple years but after one more quick check of the bag I found the camera tucked away at the bottom, making the extra 3 km very pointless! Gary and I continued on with a new sense of vigor! The Devil’s Staircase was the next big uphill and I was feeling great! I think the adrenaline of potentially losing my camera was kicking in and I was actually able to run a bunch of the stairs and some of the incline sections as well. Gary was not feeling as strong and we would later determine that much of his fatigue and nausea was due to a lack of hydration and improper electrolyte intake. After passing two very ominous crows cawing at the top of the Devil’s Staircase, Gary was beginning to grow concerned about his unsettled stomach and quickly fatiguing muscles. We met at Indian Garden, 7.4 km from the South Rim and the daylight hours were almost gone; however, a temperature gauge still read 28 degrees! The electrolyte imbalance and low hydration levels took hold of Gary and his muscles reacted in a full body cramp. I have never seen anything like it but it started with one groin then moved to both before gripping his hip flexors, lower back, lats, neck, and finally his quads. Gary is one of the most positive and happy-go-lucky people I have ever met and he still managed to pull through this with a smile on his face (although maybe it was his cheeks cramping!) I have certainly experienced some cramping in my day and we were both chuckling about this as the video camera rolled! Meanwhile, Lindsay, Stu and John were making their way up from the river and Lindsay was doing her best to force feed her Dad fluids to ensure they would all be able to hike their way out. The three helped push each other in a slow and steady manner hoping that they would not have to stay over night huddled up in their emergency space blankets! As Gary and I made our way up the South Rim along the Bright Angel Trail we were advised by some hikers that there was a rattle snake laying across the trail 100 yards back! We are both well practiced in “Bear Calls” but rattlesnakes were a whole new situation. We opted for a blend of “Rattlesnake Calls” and foot stomping to make the snake aware of our presence. Sure enough as we came around a corner there was a 3 foot rattler sprawled across the trail. We approached with the video camera rolling until the little bugger lunged in our direction and I yelped in retreat and laughter! The snake continued to rattle as we passed it beside the trail, hoping to avoid running into any more of his buddies in the bushes! Gary dodging around the rattler just after a full-body cramp! After this encounter we came across two more rattlesnakes just beside the path. The third run-in was just before we turned on the headlamps and it was coiled up less then a foot from Gary’s leg when it let out a rattle. With a whacking stick that he had procured after the second encounter, Gary gave the snake a whack and took off like Usain Bolt up the trail! For a guy who had just suffered a full body cramp, his nimble whack-and-sprint was incredible! Gary and I continued up the trail and with 4 km to go Gary’s nausea got the better of him. He let out several watery vomits that seemed to indicate he was not absorbing the water he was drinking. Despite his condition, Gary kept an amazingly positive attitude and was ready to continue slogging out the remaining four uphill kilometers. With about 1.5 kms to go he had another wave of vomiting. This spell was the most intense as it was combined with full body cramping and farting that made me fearful to stand behind him! Nick and Whitney had made their way back around the canyon by car and were hiking down the trail to meet up with Gary and me. In the pitch black of the canyon and through only the sound of crickets, Nick thought he had heard a mule not far below. As he came around a corner he found out the mule he had heard was not a haggard mule, but Gary mid-vomit! It was huge for our spirits to see Whitney and Nick join us for the final push and Gary managed to pull himself together from this scary state and muster the energy to keep going. It was incredible to see the body deteriorate so quickly but his mind stayed sharp and on-task. He knew he was close and with one foot in front of the next, he was determined to make it out on his own. We radioed ahead to have the Paramedics waiting at the rim and as we reached the top not even the paramedics could tell which hiker was in need of help as Gary kept cruising along with a smile on his face. He was later taken into the ambulance for some testing and after some abnormal heart readings Gary was taken 1.5 hours south to the Flagstaff Hospital for monitoring and additional IV fluid replacement. A few hours later the last of the Canyon Crew made their way to the top of the South Rim. It was smiles all around as Lindsay, Stu and John completed their respective, double crossing and two rim to river to rim challenges. Stu and John getting a nice reminder! The next morning on our way to Phoenix for some R & R we picked up Gary at the Flagstaff Hospital where it was clear the nurses were all sad to see him go! It was determined that he had suffered from Heat Exhaustion and a lack of hydration and electrolyte imbalance had been a major contributor to this dangerous state. In comparison to my consumption of 20 liters of electrolyte infused water over the 17.5 hours, Gary had only taken in a watery electrolyte fluid mix of 10 liters. This was an important learning experience and a situation that we will all be better prepared for in the future. The importance of hydration and particularly sodium intake during such a hot day of pushing the body to its physical limits cannot be underestimated. The Team all safe and sound! Once again the parallels of the struggles we endured and the metaphoric climb out of the canyon to reach a euphoric high point at the rim, illustrates the importance of support from those around you. Mental Health is no different and society must begin to realize the need for this same kind of support and understanding for those suffering from different illnesses as they try to cope. Thanks again to all those who have donated and supported our endeavor and please stay tuned for a final video of our adventure! If you would still like to donate, please follow this link to the DONATION PAGE - Thank you! Well it was quite a big day! Out of seven participants, 3 of us completed the double crossing, 2 finished the single crossing, and 2 completed the South Rim! More details to follow so stay tuned and thanks for all your support! The last two 1 Day for the CMHA challenges, 4 Mountains 2009 and West Coast Trail 2010 were highly successful! In hopes of building on those two events, 1 Day for the CMHA will head down south for some international exposure at the Grand Canyon. A popular ultramarathoner challenge, the plan is for sevens of us to begin at the South Rim, run to the North Rim and head back. Aka Double Crossing or R2R2R - Rim to Rim to Rim. There will be three other participants starting at the South Rim, heading down to the river, or just beyond, and then returning with the Double Crossing group on their way back from the North Rim.